Rehydrates, improves elasticity and firmness of skin. Purpose: This treatment line stimulates the structure and properties of the skin fibers – Elastin & Collage, which gives firmness & elasticity to the skin. The concentrated oxy-enriched plant extracts give extra hydration and nourishment to the deeper layers of the skin. Skin becomes firmer & retexurised, with reduction in surface lines and wrinkles. VLCC Oatmeal Scrub is a powder based preparation of natural scrub particles of Oatmeal which helps to exfoliate dead epithelial cells, blackheads and evens out rough skin. Directions for use: Clean the skin with suitable cleanser & toner. Mix the VLCC Oatmeal Scrub Powder with water till it becomes a smooth paste. Apply evenly on clean face. Keep it on for 1-2 minutes. Then massage the skin in small circular motion with wet finger tips and wipe off with moist cotton. Ingredients: Oryza Sativa (Rice Powder) 10%, Triticum Vulgare (Wheat Flour) 16%, Alpinia Galanga (Kulanjan Powder) 5%, Avena Sativa (Oatmeal Flour) 14%, Psoralea Corylifolia (Babchi Seed Ext.) 1%, Trigonella Foenum Graeceum (Fenugreek Powder) 1%, Zinc Oxide. VLCC Wheat (Green A) Gel, with the goodness of Wheat germ and Spirulina has been formulated for mature skin, which is commonly dry, dehydrated and under nourished. This gel restores hydration of the skin and gives nourishment to the deeper layers of the skin. Directions for use: Mix together VLCC Wheat (Green A) gel with VLCC Pomegranate (Blue B) gel in equal quantities, then massage in circular upward motion on the face for 7-10 minutes. Wipe clean Use a face lifting machine, if available for better results. Ingredients: Extracts of Cucumber (Cucumis Sativus) 2%, Quince (Cydonia Oblonga) 2%, Agar Agar (Geledium Amansi) 0.1%, Spirulina (Spirulina Plantesis) 0.05%, Wheat (Triticum Sativum) 2% & Seda Plant (Cynodon Dactylon) 1% and Camphor (Camphora Officinarum) 1%, Gel Base. 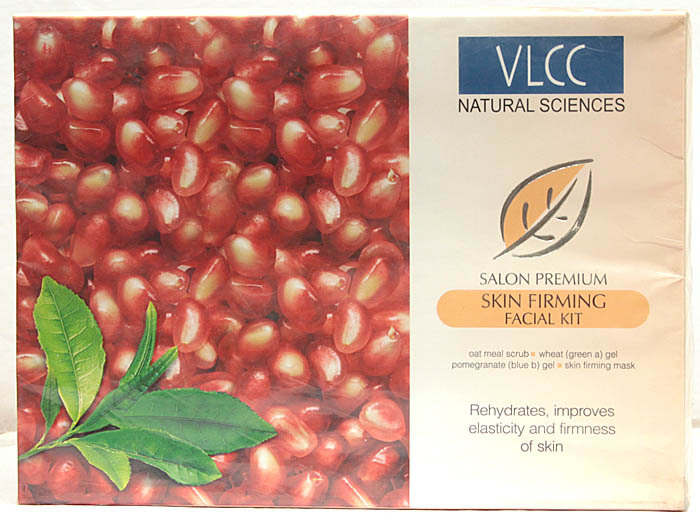 VLCC Pomegranate (Blue B) Gel, with anti oxidant properties of Pomegranate and Seda Plant Extract, helps in stimulating and restructuring of elastin and collagen fibres of the skin. The leads to firmness and elasticity of the skin and restoration of youthful appearance. Directions for use: Mix together VLCC Wheat (Green A) Gel with VLCC Pomegranate (Blue B) gel in equal quantities, then massage in circular upward motion on the face for 7-10 minutes. Wipe clean Use a face lifting machine, if available, for better results. Ingredients: Extracts of Babchi Seed (Psoralea Corilifolia) 0.5%, Magic Nut (Quergus Infegtoria) 0.5%, Indian Corn (Zeamys) 1%, Quince (Cydonia Oblonga) 2%, Pomegranate (Punicagrantum Linn) 2%, Seda Plant (Cynodon Dactylon) 1% & Spirulina. VLCC Skin Firming Mask contains active plant hormones which help in extra hydration, and improvement in the firmness of skin texture. Directions for use: After the gel massage, mix VLCC Skin Firming Mask with an appropriate qty of VLCC Rose water toner and apply on face and neck. Leave for 20 minutes till dry. Dampen the mask first, then wipe off with moist cotton. Complete the facial by using appropriate VLCC Moisturiser and VLCC Sunscreen according to the skin type if the client is going out in daylight. Ingredients: Palma Rose (Cymbopogon Martini) Oil 0.1%. Extracts of Spirulina (Spirulina Plantesis) Extract 0.2%, Magic Nut (Quercus Infectoria) 1%, Seda Plant (Cynodon Dactylon) 1% & Green Tea (Andropogon Citrus) 2% and powders of Indian Berberry (Berberis Aristata) 2%, Liquorice (Glycyrrhizza Glabra) 2%, Gum Acacia (Acacia Arabica) 2%, Lemon Peel (Citrus Bergamia) 2%, Indian Gooseberry (Embellica Officinalis) 2%, Zinc Oxide (Zincum) 5% & Kaoline (Kaolinum) Q.S. 10 Skin Firming Facial Master Sachets.